Predictably, the short-handed Spurs on a SEGABABA ran out of gas late for their third-straight loss. The San Antonio Spurs can finally get a break. After playing a near league-high 59 games before the All-Star break (second only to the Minnesota Timberwolves‘ 60) with their franchise cornerstone only appearing in nine times and only having their entire roster available once, the Spurs finally have chance to go home, rest, and hope to return in ten days healthier than they’ve been all season. Unfortunately, that bit of relieving news wasn’t enough to get them over the hump tonight. Again without LaMarcus Aldridge, Kawhi Leonard and Rudy Gay, the Spurs had to rely on a team effort and hope they could find enough offense to fend off a surging playoff team. For a while it looked like they just might pull it off, but for the second night in a row sloppiness and the lack of a go-to guy down the stretch doomed their chances. Last night it was the Utah Jazz, tonight it was a sixth-seeded Denver Nuggets team that has won seven of its last ten to stay in the thick of the playoff race with seeds 5-9 all currently at 26 losses. That doesn’t include the aforementioned surging Jazz, who is pushing up the standings on the back of a ten-game winning streak as we speak. Back to the Nuggets: facing a well rested team in The Mile High City, the Spurs started their SEGABABA shooting well, with Davis Bertans hitting his first two threes and the Spurs shooting a season-high 66.7% in the first quarter for a 32-30 lead. The Spurs would maintain this same shooting pace through out the second quarter, giving them their best shooting half since 2015, but despite getting up by as much as 10 points, that lead was depleted to 61-58 at the half thanks to a series of turnovers and lazy fouls late. As has often been the case this season, when the Spurs do one thing right (in this case score), something else lets them down. Tonight it was turnovers (18 for 20 Nuggets points) and poor free throw shooting (15-22). The Spurs came out of the half slow, leading to a quick Pop timeout after just 52 seconds and five quick points from Denver. 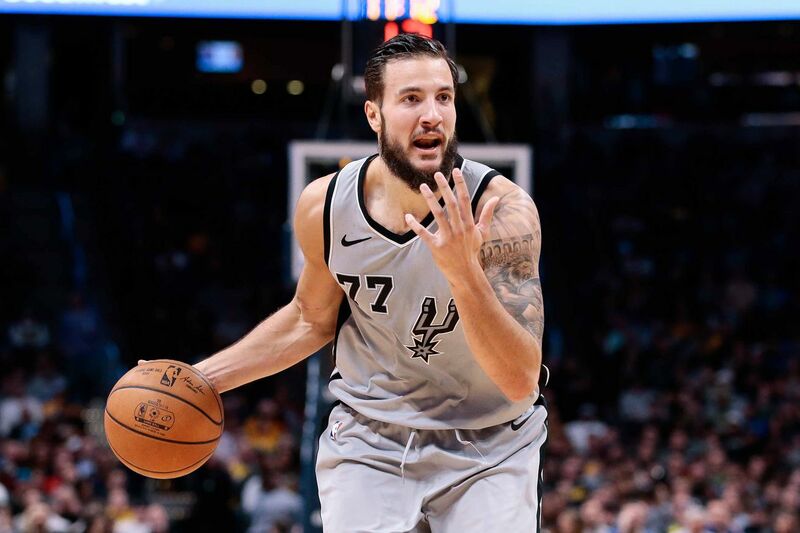 After a few more minutes, Pop went to his bench unit that had opened things up in the first half and overall outscored their counterparts 66-25 for the game, and the Spurs were quickly rejuvenated again by an unexpected source: Joffrey Lauvergne. It had been obvious throughout the first half that after 33 minutes of going head-to-head with Rudy Gobert the previous night, Pau Gasol just didn’t have enough energy tonight. His shots weren’t falling and he was getting schooled on both ends by Nikola Jokic, who is not exactly agile but has a silky shot and made mincemeat out of the 37-year-old Spaniard who probably wouldn’t have even played tonight had Aldridge been available. Lauvergne finally showed Spurs fans why he was signed in the first place with toughness on defense and the glass, running the floor for shots and put-backs, and being a general pain in the side of the opponents. Lauvergne ended the night with a career-high 26 points and 11 rebounds (his first double-double since 2016), but unfortunately it was all for naught. Even though the bench got the momentum back on the Spurs side and gave them a 90-87 lead heading into the fourth quarter, the injury bug bit again as Manu Ginobili left midway through the third with what was reported as foot soreness. He was barely limping, if at all, and it sounded more like a precautionary measure on Manu’s part that shouldn’t be an issue when they return from the break, but like everything else it was a problem tonight. Depleted even more and with everyone running on fumes, the Spurs turnover problems returned in the fourth quarter, and all the hallmark signs of a team that was out of gas appeared: three-pointers fell short, no lift on shots or rebounds, and the Spurs could no longer keep up pace with the younger, fresher Nuggets. A 15-3 run for Denver gave them a 114-103 lead with 3:17 left, and that was the ball game. The Spurs ended up losing 117-109 to fall to 35-24 on the season, 13-17 away from home, and 1-3 on the Rodeo Road Trip. The Spurs still hold the third seed in the West but are only two losses ahead of the ninth-seeded Clippers. The “second half” of the season (more on that below) is going to be a mad dash for seeds 3-8, so the Spurs will need to get healthy and figure things out in a hurry if they want to maintain their current spot in the standings. The All-Star break has constantly been a key date in determining when it will be time to start panicking. If Leonard and Gay haven’t returned or still have no timeline to do so when the Spurs return to Denver on February 23, then it might be time to start pressing that red button. For now, like the Spurs, the best thing we can all do is take a break from the most stressful season in recent memory and hope things are sunnier on the other side. Enjoy the All-Star Break, Pounders! We all need it. Tony Parker is now the all-time leading scorer in Spurs Rodeo Road Trip history. Parker has scored 1,859 points in RRT games, passing Tim Duncan’s 1,858 points. Tonight was Patty Mills‘ 500th NBA game for a 358-142 record (.717). The only three players with more wins in their first 500 games in the last 25 years are Tony Parker, Ginobili, and Danny Green — not coincidently all Spurs. I will never understand why opposing crowds still boo Manu when he enters games. Sure, he’s hurt almost everyone’s feelings with some clutch play at some point over the years, but it’s still a pretty petty act at this stage of his career, especially since it’s apparently for no other reason than your team couldn’t beat him. It’s not like he Zaza Pachulia-ed anyone. The All-Star break needs to stop being referred to as the midway-point of the season. It’s not. In fact, this season it is almost 75% of the way through thanks to the starting date being bumped back two weeks. Did this plan to stretch out the schedule backfire? Is the league seeing a relatively high number of injuries this year because it didn’t move training camp and the preseason back, leaving less time for conditioning and more games before an extended break? There’s no way of knowing for sure, but it will be interesting to see if this is a topic of conversation during the offseason.